A tent garage under 60m2 (645 ft2) which is not attached to another building does not require a building permit but must be at least 3.0 metres from another structure. Any accessory buildings that do not require a permit are still required to comply with the Town’s zoning by-laws and other applicable laws. Once you have reviewed the Zoning By-law, please contact the Building Division at building@georgina.ca for more Zoning By-law information. Note that accessory buildings are not permitted on residential lots where there is no main-use building such as a house. If your property is serviced by a septic system, your accessory structure must be located away from your septic. Please contact the Building Division by email at building@georgina.ca regarding the location of your septic system. Approval from the LSRCA is needed if you are constructing in their regulated area. LSRCA regulations may restrict construction. Consult LSRCA’s mapping tool to see if your property is regulated. 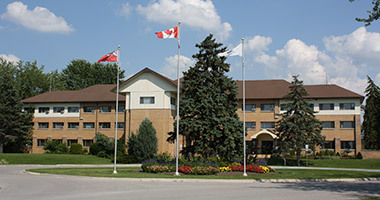 Ministry of Environment, Ministry of Transportation (for properties on Highway 48), etc. Design is the next step. You will need a set of construction drawings to submit to the Building Division for review before a permit can be issued and construction can begin. Site Plans (showing lot dimensions, north arrow, the road, any watercourses, all buildings, building sizes, dimensions of the proposed building(s), plus setbacks to property lines of all existing and proposed buildings) Note: A survey is a great starting point for a site plan as it will already have most of this information. Foundation plans (The design must be prepared by a professional engineer if proposing a slab foundation over 55m2 (592 ft2), if over 55m2 and supporting masonry or if supporting more than one story). Make sure you've got it all with our Garage and Accessory Buildings Checklist.